The village of Hengkeng (櫎坑村) has attracted painters drawn to the vista of the village, spread out on the slopes of a mountain. 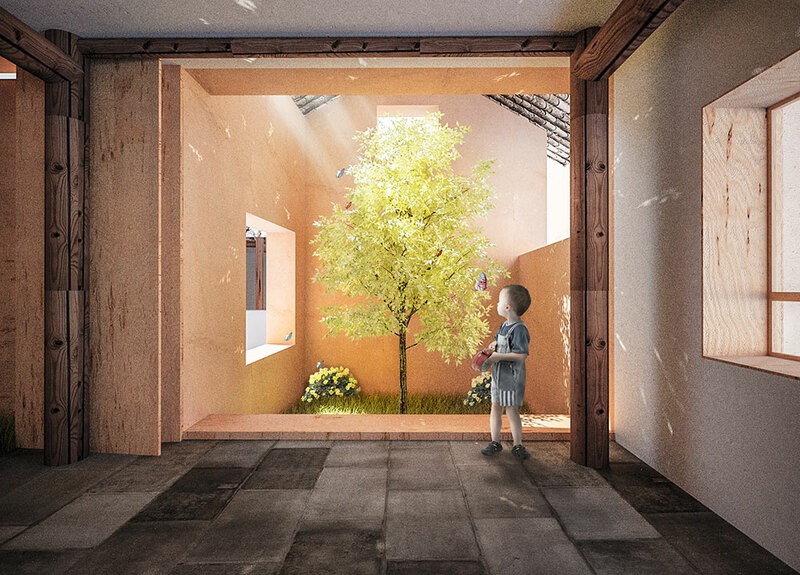 Can Architects Restore Vitality to China’s Countryside? 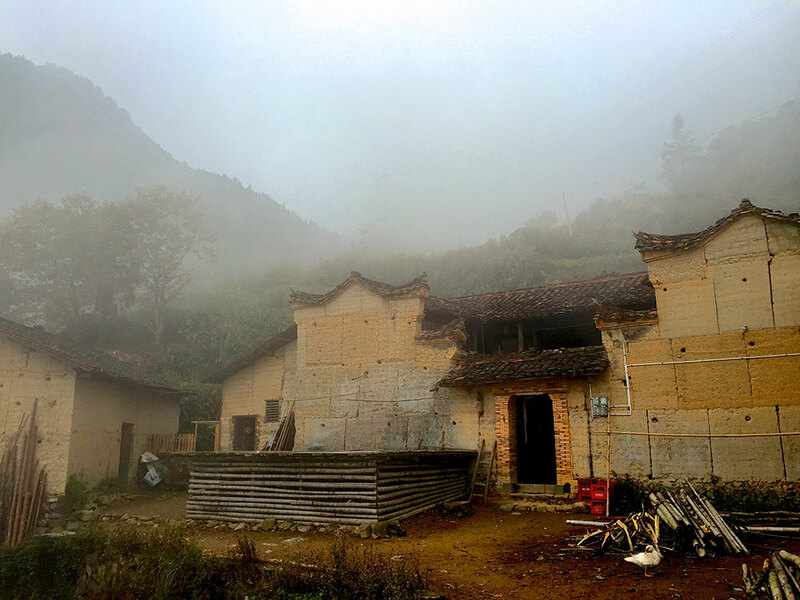 On a bamboo-covered mountaintop the mud-walled houses of Diaotan village are just barely visible through the thick fog that often shrouds this remote hamlet in China’s Zhejiang province. Worn but sturdy earthen walls still enclose the largest structure of Diaotan, the ancestral hall, or citang. Inside, a few lanterns and red couplets hang above a stone courtyard covered with moss and weeds. But the architects and a team of professors from Tsinghua University, Central Academy of Fine Arts, and the University of Hong Kong who have come here at the invitation of the local government of Songyang County think otherwise. They are trying to implement small-scale design interventions and renovations aimed at reviving dying villages and turning them into destinations for tourists and artists. They are in many ways working against time, as China’s villagers are being encouraged or even forced to move to urban areas as part of a government effort to transform China from an agricultural society to a predominantly urban one. Although nearly half of China’s 1.4 billion people are still classified as rural, the government has recently laid out ambitious plans to move around 250 million villagers into cities and towns by 2025, pushing the national urbanization rate towards 70%. In doing so, they hope to reduce entrenched rural poverty and transform the economy from its current investment-driven model to a more consumption-powered one. As villagers move to apartment housing, the logic goes, they will spend more on services and other modern conveniences like appliances and utilities. But this also threatens thousands of villages with extinction. Xu Tiantian, left, and Luo Deyin, second from left, meet with officials from Songyang County. 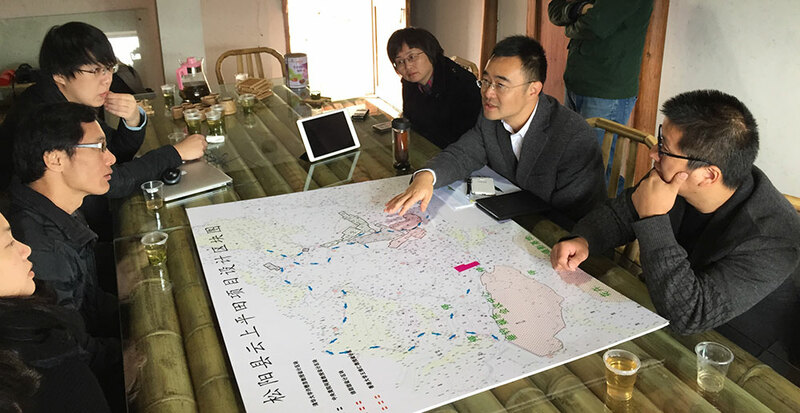 A map of the proposed project area in Pingtian village rests on the table. At a meeting with county officials the night before, Xu, Luo, and several architecture students presented their renderings of another nearby village, Pingtian, envisioning additions like glass enclosures to provide shelter for exposed earthen courtyards. Their plan calls for transforming old homes, some abandoned, into exhibition spaces and a gift shop for local crafts, and even residences for artists. Part of the design strategy involves creating public areas such as a villagers’ center and library by linking small structures to create larger contiguous spaces. “This is one of the most challenging projects I’ve worked on,” says Xu, Founding Principal of DnA _Design and Architecture, best known for the Songzhuang Art Museum outside Beijing. “We have to abandon the tricks of our profession and learn from the beginning with local builders.” For example, the new designs called for inserting more windows to bring light into structures that had been used as storehouses. But there is a delicate balance that must be struck in restoring earthen-walled, or hangtu, homes because any additions that increase the load could cause walls to collapse. Earthen walls are cheaper than brick but they keep the house warm in the winter and cool in the summer. 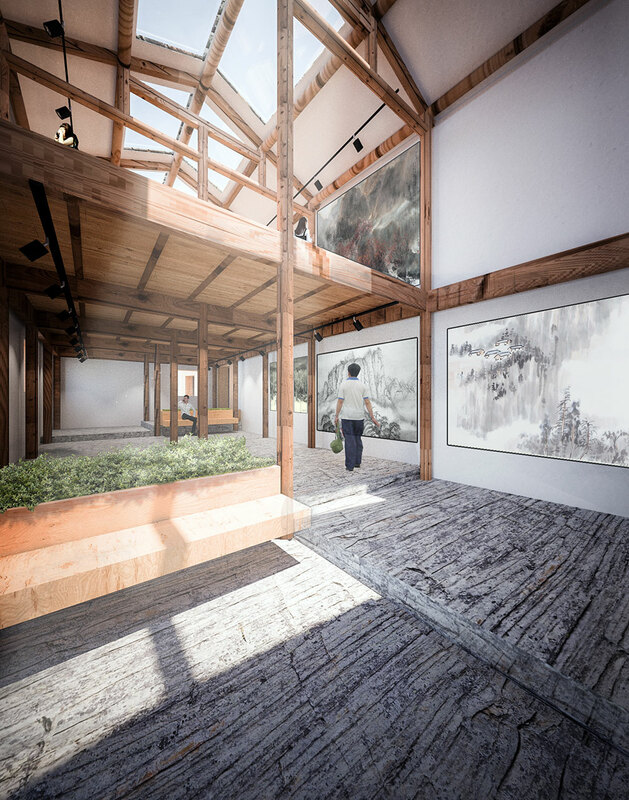 Artists rendering of a proposed art gallery in a restored wood-beam and earthen-walled structure, Pingtian. The idea of using small-scale design interventions to affect larger transformation of Chinese villages recalls the “urban acupuncture” concept that some designers have championed as a way to spur beneficial changes in cities. In Medellin, Colombia, for example, libraries and small museums have been built in slum communities in the hope that they will revitalize formerly neglected areas. While the impact of such interventions is hard to determine empirically, such projects can serve as a powerful signal to residents and officials that these communities are worth investing in. In Songyang, local officials hope to turn several villages into destinations for tourists, but they also want to avoid the rampant commercialization that has characterized other similar attempts in China: many towns across the country have become cluttered with vendors selling the same tacky trinkets, crowding out the local culture that they aimed to preserve in the first place. Luo has spent much of his career writing books and articles on the architecture and history of China’s villages. His efforts to catalogue and preserve the immense variety of rural culture and architecture in China recall the legacy of Liang Sicheng, the famous Chinese architect of the early 20th century who was the first to systematically document China’s architectural history at a time when civil war, the end of the Qing Dynasty, and Western influence caused many historic structures to fall into disrepair. 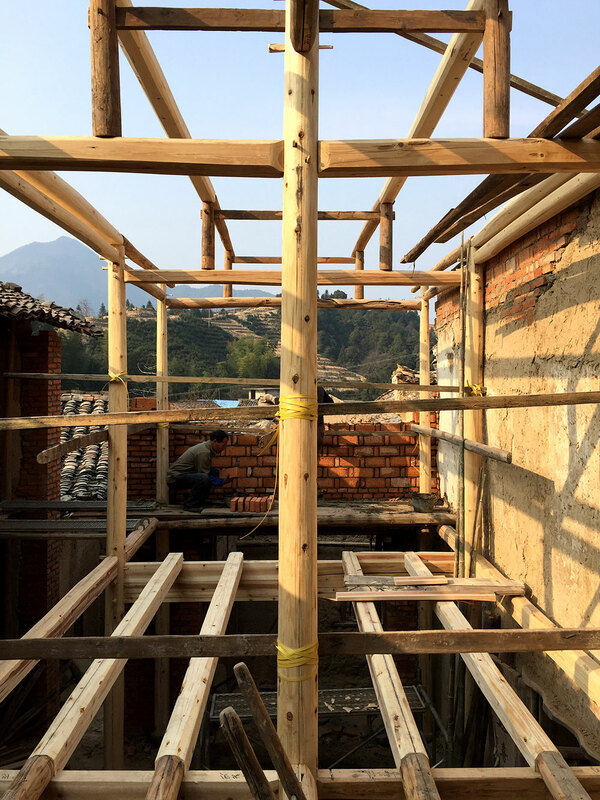 In the early stages of project work, a building in Pingtian Village (平田村) shows the exposed wood beam construction designed by a team of architects from Tsinghua University, University of Hong Kong, and Chinese Central Academy of Fine Arts. Because earthen-walled construction doesn't support much weight, architects are reconstructing some of the buildings with new wood frames. But unlike Liang, who was mainly concerned with monumental architecture and imperial building traditions, Luo is interested in the architecture of common villages that varies widely from region to region. Originally from a rural area of southern Guangdong province, Luo has lived in Beijing ever since attending college there but spends much of his time on breaks and weekends working in remote villages. Not content to merely record the history of China’s disappearing villages from the comforts of the ivory tower, Luo has also developed renovation plans and designs for restoring traditional structures in over a hundred villages. His work has taken him from the rice terraces of the Hani minority in Yunnan to historic Ming-dynasty garrison towns in northern Hebei province outside Beijing. In many villages, he has advised officials on how to develop tourism while maintaining the quality of traditional buildings. Songyang is a two-hour drive from Wenzhou, the prosperous coastal city whose residents are known for their business acumen and diaspora communities in Europe and the United States. But Songyang is also far off the well-worn tourist trail that many foreigners traverse in search of “authentic” villages—the most popular of which are the water towns near Suzhou in Jiangsu province, and the Huizhou villages of southern Anhui province. Within five years, however, a new high-speed rail station will make Songyang much more accessible. 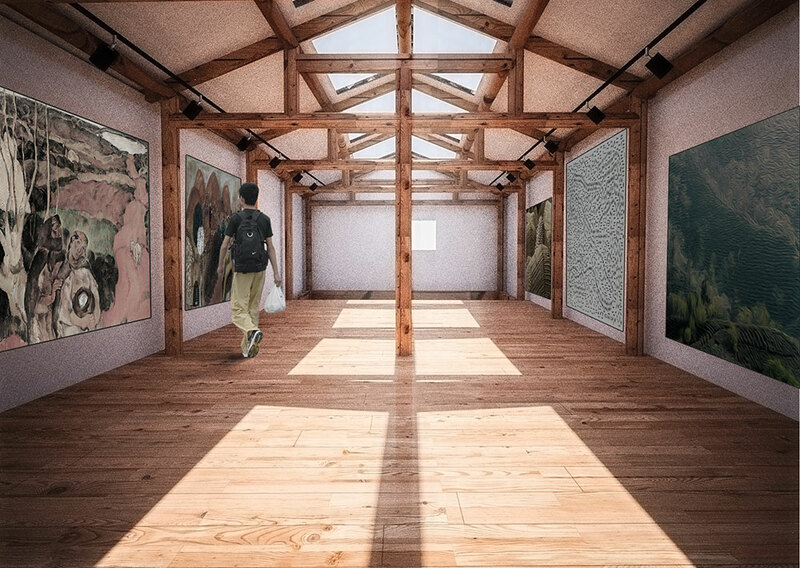 In addition to his work in Songyang, Luo is one of the experts leading a national initiative of the Ministry of Housing and Urban-Rural Development to designate historic villages, in hopes of building stronger protection for local architecture. As of January 2015, there are 2,555 listed villages nationwide, with 50 of them in Songyang County. Luo is a realist. He acknowledges that many villages in China will have no future if they fail to develop tourist infrastructure. In this sense, his approach to preservation differs somewhat from certain activists and academics of the New Rural Reconstruction Movement who advocate a return to farming and village life as a larger antidote to the ills of modern urban China. In many villages, however, the outmigration of residents makes it hard to imagine how they will ever recover any of their former vitality. In Diaotan, accessible only by one narrow road that winds up the mountain from the valley below, an estimated 100 people still reside there despite an official population of 400, according to a township official. Most of those who remain are elderly and children too young to work. And, as the sentiments expressed by some of the villagers show, many residents don’t think their crumbling old houses are anything worth celebrating. “Once Professor Luo is done working here, hopefully some of our young people will choose to come back and open up small businesses,” says County Chief Wang Jun. But at the same time, large-scale relocation projects underway across much of the country undercut this aspiration. Villagers are moving to new apartments in cities and towns faster than tourism can be developed to draw them back. Just down the road from Pingtian, new apartment blocks rise up from fallow fields. And even the village restoration plans will require some families to give up their hillside homes and relocate to apartments in the valley below. While visiting Diaotan, county officials discussed how many families would be required to move so that some of their houses can be renovated for other purposes. 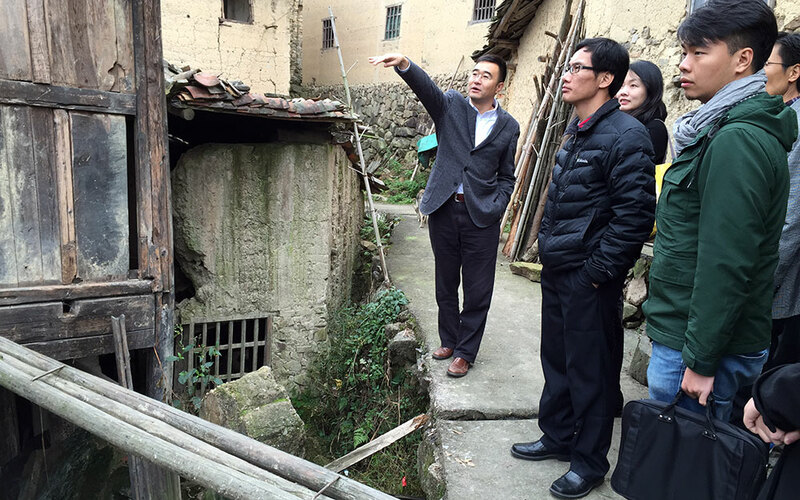 Wang Jun, left, the county chief of Songyang, points to structures requiring renovation in the hilltop village of Pingtian. In Pingtian, I join Luo, Wang, and other officials and architects to inspect the village, followed by a simple but hearty lunch of rural staples: boiled radish, steamed bamboo, pork blood stew, and rice served from a wooden barrel. Wang presides over an impromptu meeting, looking at a map sprawled out across the table, and exhorts everyone gathered in the small room, “Let’s work hard to meet our timetable and have the first phase done by next May. Can we do that?” The county finance chief nods his head and promises that the money will be available in time. Successful preservation work in China involves a complex interplay of factors, including the existence of intact historic buildings and scenic landscapes, supportive local officials, and proximity of nearby cities. Often, the very remoteness that has allowed old buildings to survive is also the obstacle that makes tourism development so difficult. In Huangkeng, a nearby hilltop enclave that has begun to attract artists because of its panoramic views, a tour bus has deposited a group of middle-aged amateur painters in the village for the afternoon. But they have no place to eat or sleep, so they will return to the city afterward. “Why don’t you build a restaurant or guesthouse here?” suggests Wang to a villager. “Otherwise the visitors won’t spend much time or money here,” he reasons. It’s a good suggestion, but the resident lacks the resources to expand his offering of tea and snacks, and the trickle of visitors isn’t enough to justify building anything larger in a space that he is currently living in. Just then, the architect Xu returns from a hike, excitedly telling Wang that she has found a building that would be suitable for renovating into a small lodge. It’s another earthen-walled structure currently being used as a storehouse for farming equipment and grain. “With the large open ceiling, the space would be perfect,” she exclaims excitedly. Our group is getting ready to depart back to Wenzhou, but Xu decides to stay behind. “Don’t worry about me, it’s so peaceful, I could stay here for a while.” Now she just needs a place to sleep for the night.